bl.uk > Online Gallery Home	> Online exhibitions	> Asia, Pacific and Africa Collections	> Deeg. The Garden-Palace. 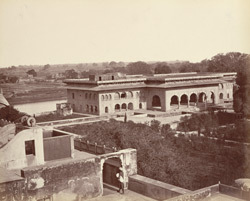 Photograph from an album of 80 albumen prints taken by Eugene Clutterbuck Impey, giving another view of the Gopal Bhavan at Deeg in Rajasthan. The Garden Palace complex at Deeg, built in 1760 by Suraj Mal (ruled 1755-63), was the retreat of the Jat rulers of Bharatpur 22 kms away. Gopal Bhavan is the largest and finest of the pavilions set around a Mughal-style garden filled with water features fed by two large reservoirs. Flanked by two smaller pavilions (the Sawan and Bhadon Pavilions named after the monsoon months) Gopal Bhavan overlooks the Gopal Sagar reservoir to the west of the garden (seen in the background of the picture). On the east side of the garden is the Rup Sagar reservoir.